If your child is struggling with fraction homework, he or she may need some extra at-home practice. Also, free fraction lessons and tutorials are available on many math websites. Keep reading to find out which of the following sites will meet the needs of your child. AAA Math has fraction lessons on several different fraction topics and are presented in a variety of ways. Some lessons rely heavily on visual aids. In these, the written explanations are short, but are followed by a bold, brightly-colored diagram or a series of examples. Other topics only have long, written explanations. After reviewing the lessons, your child can complete practice problems, which can be found at the bottom of the page. The problems appear one at a time and are corrected instantly. This site covers many topics within the broad category of fractions, including comparing, dividing, adding, multiplying and reducing fractions. The main fractions page lists all of these subcategories in a straightforward format that your child will probably be able to navigate himself. Visual Fractions offers free fraction tutorials that teach using visual aids. This site will work well for children who need to visualize how fractions work in order to understand them. 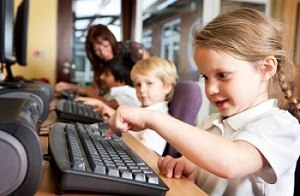 After going through the tutorial, your child can complete some of the site's worksheets or play the games. The tutorials here are printable, or they can be completed online. Each one uses large letters and bold, graphic illustrations to explain the concept step by step. These lessons are quite basic, so they would be best suited for a child who is beginning to study fractions and is having trouble with the foundation concepts. The eight interactive games engage students in colorful, playful scenes, while reinforcing the lessons from the tutorials. Here are some interactive lessons on more advanced fraction topics. The lesson begins with a discussion of fraction arithmetic. An authoritative voice reads the onscreen text and moving images below show fraction equations. You can also find a couple of games related to fractions as well as games dealing with other math topics. This site is a good fit for students in middle or high school. How Are Schools Responding to Student Homelessness?